Very recently I developed a nutrition and training program for someone (let's call him Mike) who wanted to gain weight and build tons of new muscle. Riding on my previous post (A practical guide to losing fat and gaining lean muscle mass) I thought this would be an excellent idea to show how one can use the Calorie Calculator (which can be found on www.lyfafitness.co.za) to develop a nutritional program for those interested in gaining mass and building muscles. As promised here’s a guide for you to start building muscle and adding weight to your frame. You mentioned in the beginning that you were at 57 kg’s and that you want to build large and strong muscles. I’m going to assume that you’re about 1.7 m tall and 22 years of age. By using a metabolic rate calculator [can be found here: http://www.bmi-calculator.net/bmr-calculator/] I determined that you need about 2186 calories per day for optimal energy and function. But you want to gain a lot of muscle, so we need to add to this amount of calories for you to make gains. Before we get to the amounts to add, I want to explain the program to you. The program that I've designed for you contains three phases. The first phase is exactly 8 weeks long and is designed to add major bulk to your body. The second phase is also 8 weeks long and is designed to cut away some of the fat stores gained during the first phase, but also develop nice muscle definition and quality. The third phase is simply a rest phase of two weeks long during which no training or dieting will be performed. During phase 3 you’ll just go about your normal life as if you weren't training or dieting for size. At the end of the third phase, you’ll start with phase one again and then work your way up to phase 3. Each time after phase three you repeat the process until you've reached the weight and size you want to be at and then you only stick to phase 2. These three phases have been designed so that you may first build up a lot of bulk and then secondly cut away fat and develop quality muscle. There is a rest period in between to give your muscles time to recuperate and reset after which you once again focus on bulking up and cutting down. In this manner you progressively add weight and size, while developing quality lean muscle. In this first phase the focus is entirely on adding bulk, whether muscle or fat, it doesn’t matter. 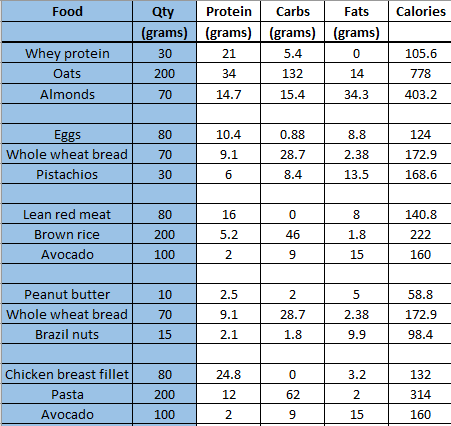 In order to add bulk you need to really spike your calories during the day for weight gain. I suggest that you add 1000 calories to your daily caloric requirement for a total caloric intake of 3186 calories per day. 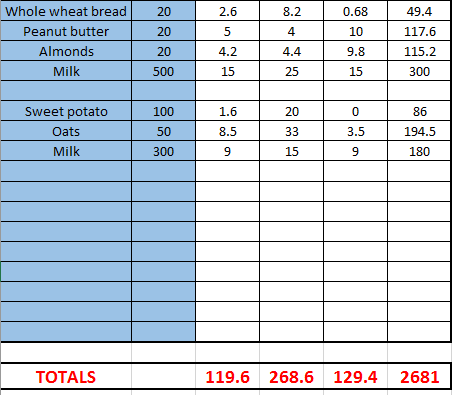 Since you mentioned that you’re a vegetarian, but that dairy products are OK for you, I've set up the diet plan to provide more or less 1305 calories of healthy fats, 141 grams of protein (about 2.5 grams per kg of body weight) and the rest in carbohydrates for energy, without adding other animal products [those that are non-vegetarian can use the Calorie Calculator to select animal foods for their diets]. Total caloric intake during the day would be 3413 calories. You'll notice on the plan that there are 5 meals to be eaten during the day, one every 3.5 hours. Food quantities have also been indicated. With eat meal you must eat at least one of the following: broccoli, green beans, spinach or green peas. You must also drink a large glass of water with each meal, this is not negotiable. 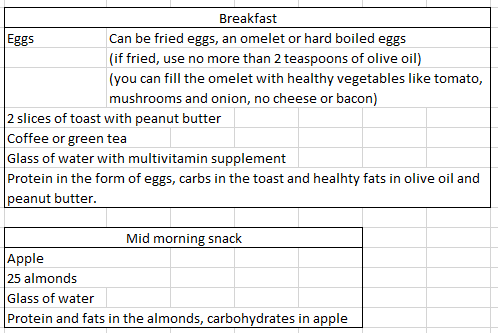 Please attempt to eat the quantities of food as indicated on the plan. It's going to feel like a lot of food, and you'll most likely feel very full and bloated at times, but you must take in all the calories for weight gain. If you skip some foods or don't eat all of it, you won't be able to gain the bulk you so long for. This training has been designed to include all compound movements. Compound movements are very important during phase one because they involve more muscle groups and hence allow you to lift heavier weights for more size and strength. Please always make sure you use the proper form and technique when doing these exercises, otherwise you may injure yourself. You do not do any cardio during phase one. When you train try to lift as heavy as you can. Each exercise must include 3 sets with 6 to 8 reps per set. Take a log book with you so that you can write down the exact weight you used in that particular set and exercise. You'll need this to select your weights for the next workout session. If you're able to perform more than 8 reps of a particular exercise in a particular set, then that weight is too light and you need to increase it. If you cannot do more than 6, the weight is too heavy and you need to decrease it. Keep up this program for the 8 weeks of phase one and then switch over to phase two. During phase two of the program, our focus switches from adding pure bulk, to cutting some of the fat gained during phase one and adding muscle shape and definition. To this end, we increase your daily caloric requirement by only 500 calories, because we still want to have enough energy for building muscle, but not so much that it'll make you fatter. I've set up your phase 2 nutrition plan to provide 120 grams of protein (2.1 g per kg body weight), and the total daily caloric intake is now 2681 calories. Just as in phase 1 you must eat a green vegetable (broccoli, spinach, green beans or green peas) and have a large glass of water with each meal. There are also 5 meals to be eaten, just as in the first phase. Again, use a logger to log the weights and reps you perform. During phase 2, aim for 10 to 12 reps per set, and three sets per exercise. 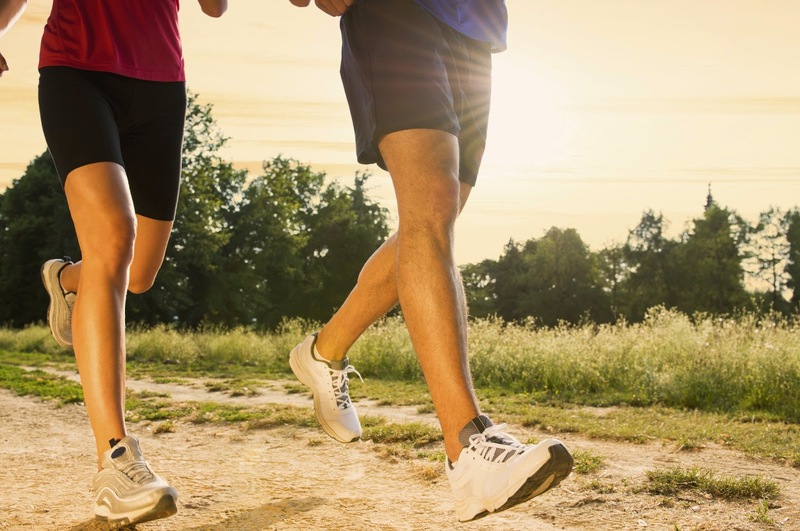 After each weight workout, perform 20 minutes of low intensity cardio. The same rules governing the weights to be used count here during phase 2 as well. If you cannot do more than 10 reps, your weight is too heavy and if you can do more than 12 your weight is too light. Follow the program like this during phase 2 for 8 weeks then move on to the third phase, which is your two week resting period. After the two weeks, begin with phase one again. 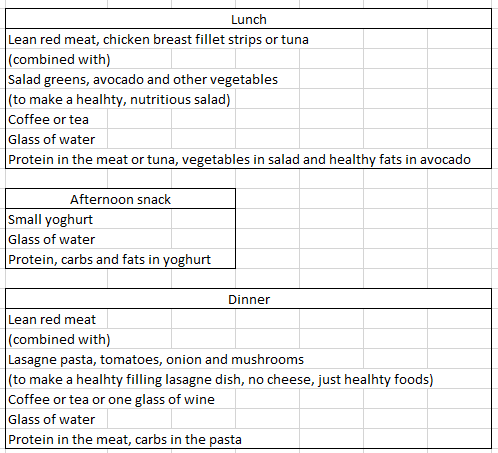 Print out these nutrition plans if you can and paste them where you can always see it. Stick to them diligently and you should be able to gain a couple of kilos in no time. Best of luck, Mike, I hope you gain tons of new muscle and strength. Please send me a message if there is anything you don't understand or if you have other questions. Also keep me in the loop on your progress. Let me know if this program is working or not. Perhaps you too can use this program if you've ever wanted to build muscle and mass. As for those interested in losing fat, I refer you to my previous post, A practical guide to losing fat and gaining lean muscle mass. Best of luck to all of you! Have you ever contemplated a switch-over to a vegetarian or vegan diet? Are you already following a vegetarian or vegan diet? Do you wonder what the differences are and the pros and cons of each? In this post I describe some of the differences between these types of diets. Hopefully this may shed some light on the subject for you too. 6. People on vegan or vegetarian diets are generally in better moods, suffer less from depression and anxiety, live longer and are overall happier, healthier people. There are a number of different types of vegetarianism depending on the preferences of each diet. Lacto-ovo-vegetarianism, for instance, includes the consumption of dairy and eggs and lacto-vegetarianism only the consumption of dairy. Then you get the vegan guys who do not consume or use any animal products whatsoever. Still more types of vegetarianism and veganism exist, all of which revolve more or less around the same concept, the exclusion of meats or animal products from their diets and their lives. For the human body to survive and thrive, we need a balanced diet which contains the macro-nutrient elements, protein, carbohydrates, fats and water and micro-nutrient elements which include a whole range of vitamins, minerals and antioxidants. For vegetarians and vegans, adequate protein intake will be a concern, as their diets may be lacking in protein and essential amino acids for optimal health. But, while there is concern for protein intake, daily needs for most people may be met by careful planning and execution. Why is protein so important for optimal body function? Proteins are the building blocks of our muscles, organs and other tissues of the body. It also plays a role in the maintenance of our bones. Without adequate protein intake, we would lose muscle mass and also the ability of our muscles and organs to contract and move. What then can vegetarian and vegan dieters do to ensure adequate protein intake? There are a number of essential amino acids that we need every day for optimal function. These essential amino acids cannot be manufactured by our own bodies and therefore we need to consume them in order to stay healthy. Meats and other animal products easily provide all the essential amino acids we need. Thus, for lacto and lacto-ovo vegetarians, dairy products and eggs will be more than sufficient to cover their protein needs. But for vegans (and vegetarians also) enough protein may be obtained from foods like legumes, lentils, soy products, nuts, seeds and whole grains. Vegans, must also ensure that they eat a variety of protein foods and enough of it during the day in order to get all the essential amino acids they need. One good way for vegans to obtain enough essential amino acids is to combine different plant food sources like brown rice and beans or lentils, or perhaps hummus and whole wheat pita. Another concern about vegetarian and vegan diets are that they are particularly poor in vitamin B12, calcium and iron, all very essential minerals and vitamins for optimal health. Calcium is important for strong bones and teeth. Strong bones keep you upright and improves your posture and good healthy teeth gives you a bright smile. Both posture and a great smile will earn you tons of respect and popularity and open many doors for you as you progress through life. Calcium also plays a role in muscular contractions and it is a vital micro-nutrient for the prevention of osteoporosis and deformation of our bones and skeletons. A normal healthy functioning human being needs approximately 1200 milligrams of calcium per day. Vegetarians may ensure that they get enough calcium by consuming dairy products like milk and cheese. Both vegans and vegetarians can also get their calcium from dark green vegetables, such as turnip and collard greens, kale and broccoli. Vegans should especially eat generous amounts of these foods to ensure adequate calcium intake. Calcium may also be obtained from calcium-fortified foods and foods like soy milk, soy yoghurt and tofu or from non-animal derived calcium supplements, if that’s allowed in your diet. Vitamin B12 is very important for human body function because it is necessary to produce red blood cells and is involved in the entire lifecycle of a blood cell. Vitamin B12 deficiency can lead to anemia and central nervous system damage, the symptoms of which include sluggishness and weakness. The problem with vit B12 is that it’s almost exclusively found in animal products. This makes it very difficult for vegans to ensure adequate vit B12 intake. It is therefore recommended that vegans supplement their diets with non-animal derived vit B12 supplements. Vegetarians, although having more options as to animal foods, will also benefit from a great vit B12 supplement. Iron, the other concern for vegans and vegetarians is an important component of hemoglobin and myoglobin (read blood) and therefore plays a crucial role in oxygen transport throughout the body. It is also an important active part of enzymes which play a role in cell respiration. Iron deficiency can lead to anemia as well. What makes iron intake difficult is that the bio-availability of iron in vegan and vegetarian foods is low. So while both vegans, vegetarians and non-vegan/vegetarian dieters consume roughly the same amount of iron, less of it is absorbed from vegan/vegetarian foods. Vegans and vegetarians therefore need to ensure that they eat larger amounts of the following foods for enough iron: dried beans and peas, lentils, enriched cereals, whole-grain products, dark leafy green vegetables and dried fruit. Iron absorption can also be improved by ingesting foods and drinks rich in vitamin C while eating iron rich foods. Foods high in vit C include: strawberries, citrus fruits, tomatoes, cabbage and broccoli. Apart from these very important minerals and vitamins, vegans and vegetarians need to make sure that they use enough iodized salt on their food to ensure adequate iodine intake and ingest enough food to ensure omega-3 fatty acid intake, vitamin D intake and zinc. Iodine deficiency weakens the thyroid system which slows down metabolism and may lead to a goiter. Iodine, zinc, omega-3 fatty acids and vitamin D may be obtained from soy milk, rice milk, cereals, whole grains, nuts, seeds, wheat germ and a healthy amount of sunshine. From the above it is clear that, although lacking in some departments, a vegan or vegetarian diet is definitely doable and may be a very healthy option for those looking to lose weight. The question now becomes, how can one go about planning a vegan or vegetarian diet? For vegetarians planning a diet will be easy. They have more options when it comes to protein and the essential minerals and vitamins the body needs. All they need to do is to ensure adequate portions of protein, vegetables and fats on their plates with every meal, and they're set. Vegans, on the other hand, must use a little bit more cunning in their planning and construct their meals so as to include different varieties of foods. A vegan wanting to include enough protein in his/her meal must for instance look to combining different foods to ensure adequate protein and carbohydrate intake. For instance, a good meal for a vegan person would include a mixture of brown rice, lentils, chickpeas, broccoli and some nuts and seeds. All of these together may deliver the protein, carbs and fats your body needs for optimal function and health. 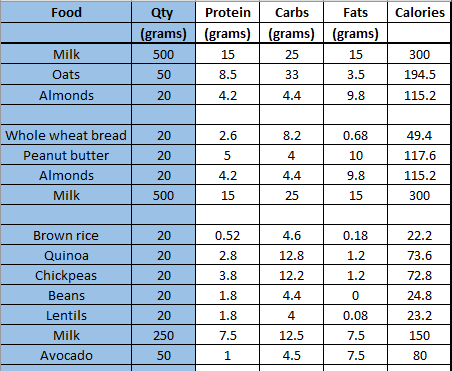 If you want to see how my wife and I constructed meals for adequate nutrient intake, keep following this post for a weekly update of our month long vegan experiment. Yes that's right, as soon as we learned about the benefits of a vegan diet, we took up the challenge and decided to follow our very own vegan diet for one month. If you’d like to see how we did it and what benefits we got from following a vegan eating plan follow this blog for regular updates. You can see feedback from the first week of our vegan experiment here. We have never before attempted a vegan diet and thus are vegan-virgins as it were. Those of you who follow a vegan diet or have been following for quite some time could give a comment and perhaps a tip or two on our vegan experiment. Find an update of Week 1 here. Weeks 2 and 3 here and here. And week 4's update can be found here. For now, I hope that this post could help you to find out more information on the different types of diets as well as the pros and cons of some of them.